Do you have a garbage disposal? Do you have problems with smell in your garbage disposal? Do you spend money on deodorizing tablets to toss down the garbage disposal? 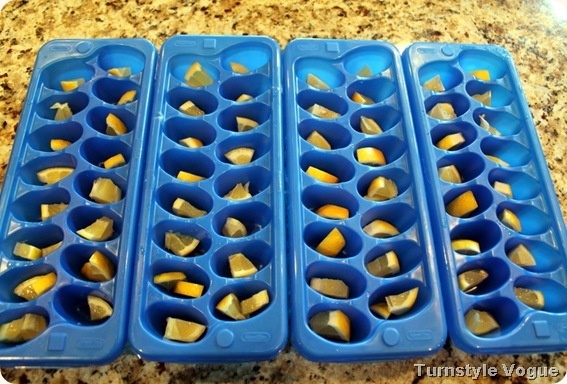 -- Slice lemons, put in one slice in each ice cube tray section and cover with vinegar. Do not dilute it. Freeze, and then store the ice cubes in a Ziplock bag. Pop one of these little cubes in the garbage disposal when needed, and grind away! Jessica Lyn Larrew suggested: If you freeze them with coarse salt in the water, the salt will help clean your disposal blades too! Michelle Stricklin Williams posted: GREAT IDEA! I pour about a cup of vinegar in my dishwasher to help with gunk and funk. Works great, keeps drains clean, and unclogged!